The coastal reaches to the north and south of Hawkes Bay feature a series of niche beach communities where surf launching is the order of the day. Without formal launching facili- ties, conditions limit the size of boats that can be put in on these coasts and also make the buoyancy and stability of pontoon designs very desirable. These circumstances are mirrored in many parts of the country. The Senator RC 440 Family Series hull, the smallest of their range of pontoon and plate hulls, fits this bill admirably and is a popular model for the Napier company situated right in the heart of this territory. Senator Boats has been in business for 14 years, with principal Wayne Mckinley having a 20-year history in alloy boat manufacturing. 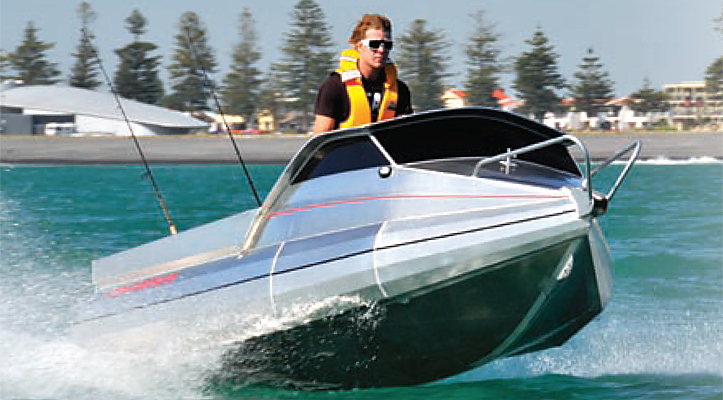 The RC 440 Family Series hull was initially designed as an entry- level hull for the first-time boatie, but has proven to be a versatile all- rounder, suited to fishing, diving and family fun. Billfish have even been caught from them, although they are obviously a bit small for hard-core gamefishing.